The great Professor Derrick Bell died yesterday, arguably the founder of critical race studies in the US, and no one would dispute he was one of the two or three original founders. He was the first tenured black faculty member at Harvard Law School and a leading constitutional scholar, as well as an activist fighting for racial change — including the desegregation of Harvard Law School along racial and gender lines. Derrick Bell brilliantly pioneered in critical race thinking when few were doing that in legal studies, and he generated brilliant new ways and methods of talking about racism in the law and society, such as by creating fictional and allegorical narratives to make critical conceptual and empirical points. His method has revolutionized some legal presentations and theories, and his work on innovative methods in the law journals was (and still is) in my view way ahead of the mainstream presentation methods that are standard in social science journals’ work on racism issues. He also pioneered in critical and provocative and influential concepts such as interest convergence and racial realism. The allegorical “chronicles” in 1987’s And We Are Not Saved: The Elusive Quest for Racial Justice and his 1992 publication, Faces at the Bottom of the Well: The Permanence of Racism attempt to expose the transparency of nominal, virtually meaningless civil rights advances. “Racism is not a passing phase but a permanent feature of American life,” the New York Times summarized. “Despite all the change over the years, [Bell maintains that] blacks are worse off and more subjugated than at any time since slavery.” In a conclusion that is particularly grim for a crusading civil rights lawyer, Bell claims that legal victories are hollow if society’s mind-set remains unchanged. He often refers to the Brown v. Board of Education case as an example, claiming that the 1954 school desegregation decision by the Supreme Court was neutered when whites began to abandon public schools and flee the cities. In general, Bell judges that civil rights laws and decisions are worthless because America’s white-dominated society continues to undermine black advancement while allowing racism to prevail. This link suggests that the legal profession has not yet come to grips with the racial realism of a true genius and great US intellectual leader (note the word “renegade” for him) and the evidence for his racial realism view that we regularly demonstrate on this blog. May he rest in peace, finally. When I taught a graduate seminar this past winter, I asked the class if anyone knew what the word “miscegenation” meant. No one did. And, when I teach at the undergraduate level, it’s the rare student who knows the meaning of that word at the beginning of the semester (they usually know it by the time the semester ends). 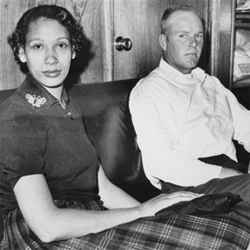 So, I thought it important to recognize the passing of one of the pioneers in ending the anti-miscegenation laws in the U.S.
Loving is usually described as an “inter-racial” marriage case, but it even goes beyond that. The statute in Virginia didn’t ban “racially mixed marriages ” as the article describes, but only some racially mixed marriages. It made it a felony for “any white person [to] intermarry with a colored person, or any colored person [to] intermarry with a white person.” In other words, Blacks, Native Americans, Asians, or any other persons of color could marry with each other, but could not marry someone who was White. The state’s need to defend “racial integrity” as Virginia claimed fell flat because the statute was designed to preserve White racial purity exclusively. Its one of the quintessential White supremacy cases of the era. Bergin’s cogent analysis of the old “racial purity” arguments of white supremacy from another era should make us wary of similar kinds of arguments today about supposed racial purity in the era of DNA and genetic testing. And, Loving’s passing is a reminder of the difference that once person can make in fighting against white supremacy. “In the early history of the United States, Mr. Fredrickson wrote, whites needed an ideology of racial superiority to justify importing slaves and uprooting and killing American Indians while pushing to establish an agrarian economy in their new land. South Africa, by contrast, historically had more tolerance of racial mixing and a more pragmatic definition of whiteness, in large part because of a shortage of “pure” Europeans, especially women, Mr. Fredrickson wrote. The countries differed in laws governing race. The United States had founding documents promising equality that over many years it tried, fitfully, to live up to. In Mr. Fredrickson’s view, the United States, with its history of slavery before the Civil War, had a worse racial past than South Africa did but a better means, in law, to move on to better relations. Fredrickson’s last book (he wrote eight books and edited four) was published this year, titled Big Enough to Be Inconsistent: Abraham Lincoln Confronts Slavery and Race, is about Abraham Lincoln’s conflicted stance on slavery, emancipation and states’ rights. His was a great mind and he will be missed.